Taupe is one of the most versatile neutral colors in the decorating world. It adds warmth to a room as an accent or as the prevailing color in your decor. A sofa is a major investment and when you choose one in taupe, you will have the ability to change your decor easily. While a taupe sofa may initially appear bland, the addition of patterns, colors and textured accessories will bring it into focus as a sophisticated piece of furniture. A taupe sofa will give you many choices when you plan your decor. Choose your palette. Create a calming and relaxing environment with soft, cool colors. Shades of pale aqua or sage are reminiscent of the relaxing beach and will go well with taupe. Warm colors also complement taupe. Use deep reds or earth tones to decorate a room that is cozy and inviting. Accent your sofa with several decorative pillows. Bold patterns will add interest to your sofa. Paisley or geometric designs will provide contrast. Fringe, tassels or ribbon trim have pleasing texture. Place a patterned area rug in front of the sofa. 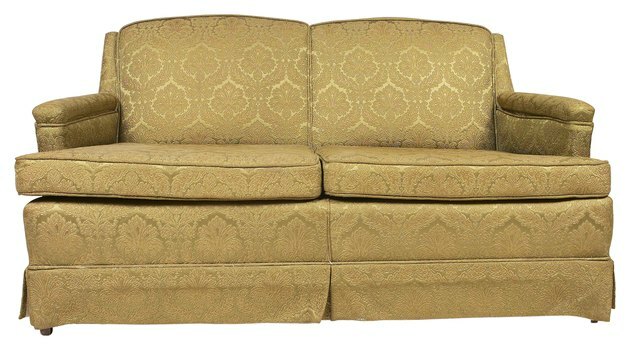 A lively design will highlight your neutral sofa and will become the focal point of the room. The rug should reflect your wall and accent colors. Complement the sofa with chairs upholstered in contrasting colors or materials. If your sofa is a contemporary fabric style piece, consider leather chairs for a sleek modern look. Red, navy blue, deep brown or green would be beautiful choices. Linen-covered chairs are an option if your palette consists of soft colors. You can also choose cotton with a chintz design. Decorate your walls with interesting art. Display paintings that reflect your color choices and the theme of the room. Handcrafted ceramic tiles can be grouped together effectively. Hang decorative textiles on the walls -- handwoven rugs or quilts. A collection of sepia photographs in simple black frames would make a strong statement. Should I Put a Couch in Front of a Window?